It’s the latest literary spat. Mark Rowlands, a British philosophy professor who spent a decade living with a wolf, gave a savage review to Alexander Fiske-Harrison’s book Into The Arena on the art of the matador in the Times Literary Supplement in September. Now Fiske-Harrison is as wounded as a bull lanced by a picador — and the men are locked in a battle of letters and blog posts against each other. 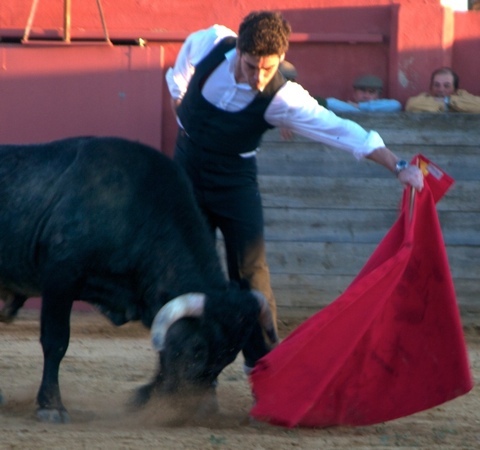 Fiske-Harrison’s complaint is that Rowlands, who concerns himself with animal welfare, would be naturally indisposed to his love of bull-fighting, not to mention that Fiske-Harrison has previously given him a bad review. “Mark Rowlands is a proponent of vegetarianism and once tried to make his pet wolf into one, as described in The Philosopher and the Wolf,” says Fiske-Harrison. Professor Rowlands, who teaches at the University of Miami, had described Fiske-Harrison’s writing as being infected with “vainglory” and “startling arrogance” in his love of bull-fighting.The red rag in this feud was first waved two years when Fiske-Harrison reviewed Mark Rowlands’s wolf book for Prospect magazine. “If you combine misanthropy and lycophilia,” he wrote, “the resulting hybrid, lycanthropy, is indeed interesting but philosophically quite sterile.” Over to Rowlands. “I felt rather guilty that I was dispensing such a negative review,” he tells me. “I did, of course, inform the TLS of the fact that he had previously reviewed a book of mine. I resent the suggestion that my negative review was the result of personal animus … [it] was the result of the book not being very good.” Rowlands has also called Fiske-Harrison “thin-skinned”. The blog argument now runs to several thousands words, with still no victor in sight. P.S. I suspect that Rowlands’ loathing of the book is more about my having fought a bull – see photo from my book above – than my ‘love’ of watching it. My aficion, or ‘love’, is actually what is in question throughout the book, something every other reviewer noted. As for the idea that a review could wound me – well, that’s just nice journalism I guess. My actual issues with Rowlands are quite clearly pointed out in our exchange in the letters’ page of the TLS here.